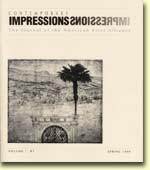 An up-to-date listing of all books reviewed in the journal Contemporary Impressions. Museums and universities which open their print collections to the public for study. A simple glossary of Printmaking Techniques. Professional practices and standard forms like slide labels and documentation sheets to help printmakers. Some information is for subscribers only. Find places to use presses and make paper, including workshops offering classes to teach you how. Our Guide to Printmaking, Papermaking and Book Arts Workshops is a benefit for subscribers.